The Mint Building also connects with the Bonnell Building. The West Building connects to the Pavilion. Popular spaces for College events, the Large and Small Auditoriums, are also located on the ground floor. The Rotunda level connects to the Mint Building. The Coffeehouse and Great Hall are also located in this building. Take exit 22 towards I-676 West/US-30 West/Central Philadelphia. Merge onto the Vine Street Expressway and continue on I-676 West. Exit on 15th Street and turn right at Vine Street. Make the first right onto 16th Street and then turn left at Spring Garden Street. 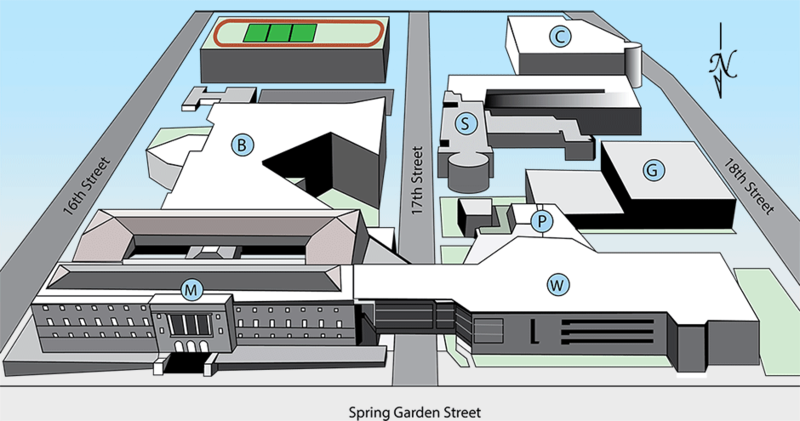 Take the first left onto 17th Street and the College’s parking garage will be approximately 200 yards on your right (next to the Winnet Building). Take exit 343 from Spring Garden Street toward Haverford Avenue. Turn left at Spring Garden Street. Make two slight left turns to get onto and continue on Benjamin Franklin Parkway. Turn left onto Art Museum Drive. Continue onto Spring Garden Street and the College will be on your right. Take exit 344 for I-676 East/US-30 East toward Central Philadelphia. Merge onto I-676 South/US-30 East. Exit toward Benjamin Franklin Parkway. Turn left at 22nd Street and then right at Spring Garden Street. The College will be on your right.